This fun compound word learning game teaches important concepts for preschool and elementary school kids. A great way to build the foundation skills that today's elementary school curriculum requires. Children will themselves work to develop their focus and skills. Here are 30 self checking puzzle matches of compound words that can be used with the whole class, small groups, or in centers. These are words that are used in the classroom! The instruction page has several games to play using these pieces. For example, give each child a puzzle piece, making sure that another child has the matching piece. The students then scramble to find their match. The puzzle matches are: playmate, textbooks, weekday, lunchroom, bathroom, thumbtacks, classmate, worksheet, bookworm, blackboard, playground, keyboard, backpack, chalkboard, friendship, handwriting, sandbox, flashcards, whiteboard, notebook, restroom, desktop, headphone, schoolwork, hallway, homework, bookmark, classroom, bookshelf and printout. It can easily be adapted for the littlest learner by only using the simplest word concepts introduced. 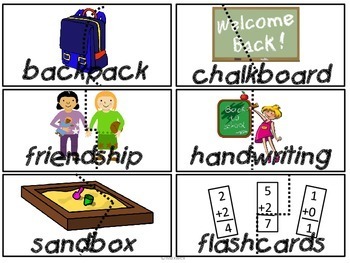 Plus little ones will use the pictures, while the older student will read the words. Print, laminate, cut apart, and use year after year! Don’t have time to cut puzzles? You may have a valuable, untapped resource, in your student’s parents! Many parents work and are unable to help with activities or projects in the classroom. This is their time to shine! Simply send home the puzzles after laminating, with directions about how you want them to be cut. The puzzles come back with both the student and parents proud to be involved in helping the teacher!